I am quite disappointed with the result of the Italian bread I tried baking yesterday. It took me two days to get the darn dough to prove because the method is to use biga. Biga is a mixture of flour and yeast, made to rise for 6 hours and left in the fridge for another 12 hours. Then, the biga is added to a new batch of dough and made to rise for another 3 hours. That is almost a freaking one day of work. 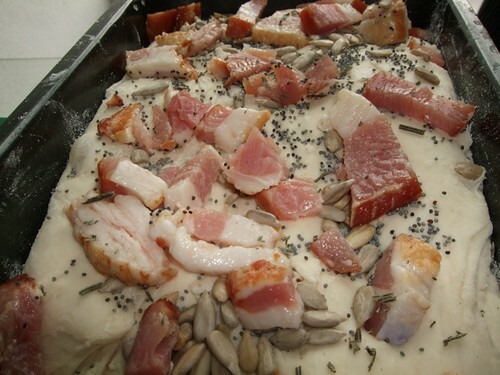 So, I thought that this bread (before baking) with pieces of bacon, sunflower seeds and poppy seeds are going to make me an Italian. After all, it took me two days. But the texture is not what I had expected. 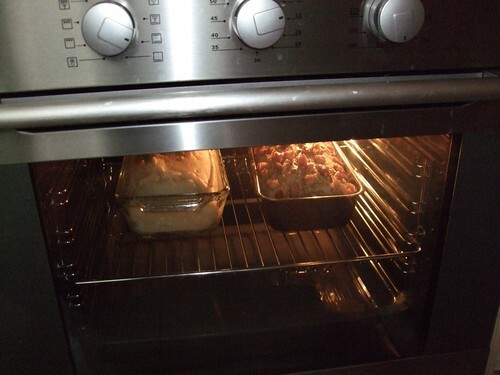 The bread is to be baked with a pan of water to make it soft. The texture is soft and the crust crispy. However, it is rather dense and heavy. The saving grace is the pieces of bacon on top which makes the bread really yummy. We finished the one with the bacon but the other plain loaf is still standing on my dining table. I have turned it into mini pizzas by baking with ham and cheese. Oops..what a waste. Sometimes the recipes we follow don’t turn out well. Maybe another try with some experiment will get it right. Hey there! I’m a pastry chef and happened to stumble on your site – which is so much fun! 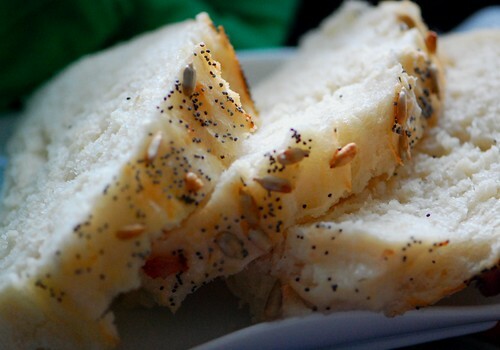 I don’t normally work with breads but a dense texture normally happens when bread dough is overmixed – most Italian breads are only mixed for a few short minutes. And instead of using the pan of water – you could try just throwing some ice cubes into your oven to produce more steam, and then maybe a better, crunchier crust. Hope this helps in any way! And good luck with your future cooking!